I use liquid makeup daily to help even out my skin, and give me a flawless face. I have been using this for over a month now and I have to say that I have some likes and dislikes about this. I like the foundation itself. It goes on the skin smoothly and is easy to blend and buff into my skin. 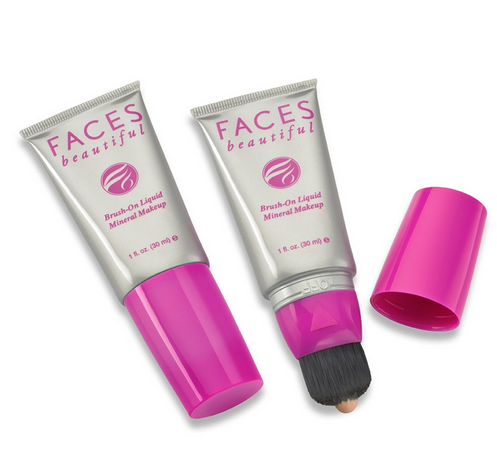 It provides a light to medium coverage that can easily be built up to whatever coverage you need. It feels light on the skin, and doesn't cling to my dry patches. However, the brush on this just doesn't work for me. I like to use a fluffy kabuki brush to really blend my foundation in. I just squeeze the product out and place it on the back of my hand, and use my kabuki brush to apply it. I do have to set this foundation or else a few hours later it has completely melted off my face, which is a downer considering I have dry skin, so powder sometimes isn't my friend. At the end of the day this is a really nice foundation. If the brush was gone I would love it even more!